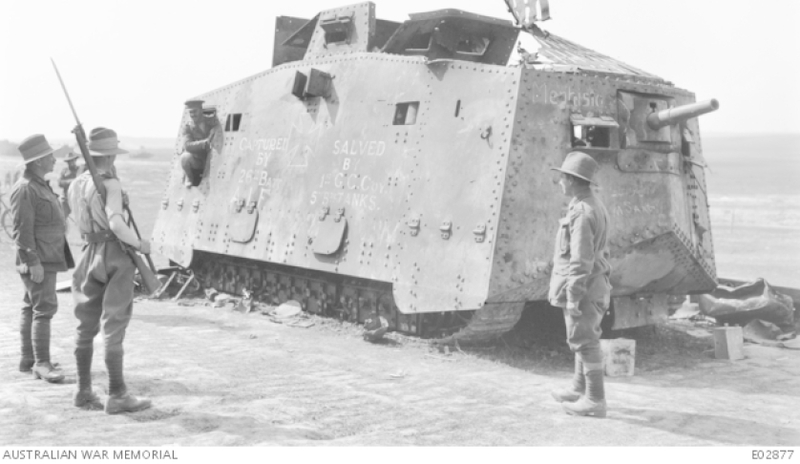 She was captured by Australian troops during the defence of Villers-Bretonneux during the First World War and has held pride of place in the Queensland Museum, now Mephisto, the German A7V Sturmpanzerwagen tank, has been immortalised in a new book documenting the tank’s capture and history since the end of the war. Co-authored by Greg Czechura and Jeff Hopkins-Weise, Mephisto: Technology, War and Remembrance, launching on 20 July 2018, is a handsomely illustrated reference book that looks at the development of tanks against the backdrop of the First World War and gives voice to the Australians who fought on the Western Front in France and Flanders. “Mephisto is an incredible and valuable part of the Queensland Museum collection and holds a special place in Queenslander’s hearts. Mephisto: Technology, War and Remembrance is a fitting tribute to this iconic tank, telling its story and what it represents to the people of Queensland,” Queensland Museum acting chief executive Dr Jim Thompson said. New large images of Mephisto, a comprehensive list of many early tank designs from 1900-1918 and photographs of many of the 13 men who made up the 26th Battalion recovery party are some of the features of this detailed history. Mephisto: Technology, War and Remembrance provides a detailed account of the tank’s capture near Monument Wood, after it had lay abandoned in No Man’s Land for three months following its immobilisation on 24 April 1918. Soldiers from the Queensland-raised 26th Battalion, part of the Australian 7th Brigade, played a major part in helping push the Allied front line past the point where Mephisto lay, leading to its carefully planned capture on the night of 22-23 July 1918. The use of tanks in some of the most famous battles of the Western Front ― Flers Courcelette, Bullecourt, Cambrai, the Michael Offensive near St Quentin, the Battles of Villers-Bretonneux, the Battle of Amiens ― is covered, the book building to a crescendo with the most detailed examination of every facet of the German A7V tanks. Mephisto: Technology, War and Remembrance will be launched on 20 July to coincide with the centenary of the tank’s capture. Mephisto will be unveiled again as a centrepiece of the Queensland Museum’s new Anzac legacy gallery opening in November 2018. In addition to 250 limited edition boxed and signed books, hard cover and soft copy versions of Mephisto: Technology, War and Remembrance will be available at Queensland Museum Network bookstores, online and through book retailers. The Anzac legacy gallery is a joint initiative between the Queensland Government, Anzac Centenary Public Fund and the Queensland Museum.